Stephanie Benske was born and raised in Omaha, Nebraska where she graduated from the private high school Omaha Marian High School. After graduate from Omaha Marian, Stephanie was accepted at and attended Creighton University in Omaha, Nebraska. While at Nebraska Stephanie gained valuable work experience working at the State Legislature and working on political campaigns. As a member of the sorority Chi Omega Stephanie developed lasting friendships and acted as the Sorority’s Secretary for two years. Stephanie graduated with her Juris Doctorate degree from Creighton Law School in 1998. During law school, Stephanie was accepted as a visiting scholar at Marquette Law School for her third year of law school. She also gained valuable experience working as an intern for the Honorable Daniel Noonan at the Children’s Court Center in Milwaukee County, Wisconsin. Stephanie relocated to Wisconsin. After successfully completing the Wisconsin Bar Exam Stephanie joined Brazil & Thelen in 1998. Stephanie quickly proved to be a valuable addition to the firm and was named a full partner by 2000. 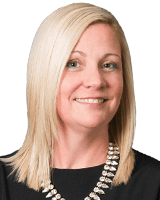 In addition to quickly proving her legal talents at Brazil & Thelen, S.C., Stephanie has been widely recognized as a Super Lawyer in Milwaukee Magazine in 2007, 2008, 2010, 2011 and 2012. Stephanie has prepared materials for and taught legal seminars on adoption and family law related issues for other attorneys through the National Business Institute. She has appeared on Dateline with fellow partner Paulette Brazil on a family related case. She has been a member of the Inns of Court, Society of Family Law, Justinian Society and the Wisconsin Club. She has also used her political campaigning skills to assist with judicial campaigns. She has donated her time at the Volunteer Self Help Legal Clinic which was offered at the Milwaukee County Courthouse. Stephanie graduated from the University of Wisconsin – Milwaukee’s Mediation program. Stephanie provides mediation services for family related issues. Stephanie is also an experienced adoption attorney. Not only has Stephanie handled numerous adoption cases but Stephanie offers the unique experience of having adopted children of her own both in the international and domestic setting. Stephanie also works at the Children’s Court Center handling CHIPS cases both in private cases and as an intake attorney at the Center. She is also experienced with guardianships. Stephanie enjoys spending time with family both here and in Nebraska. She enjoys many activities with family and friends including supporting the Wisconsin Badgers and her fellow Nebraska Huskers. In her free time she enjoys learning all aspects of cooking and enjoys discovering new places through travel.